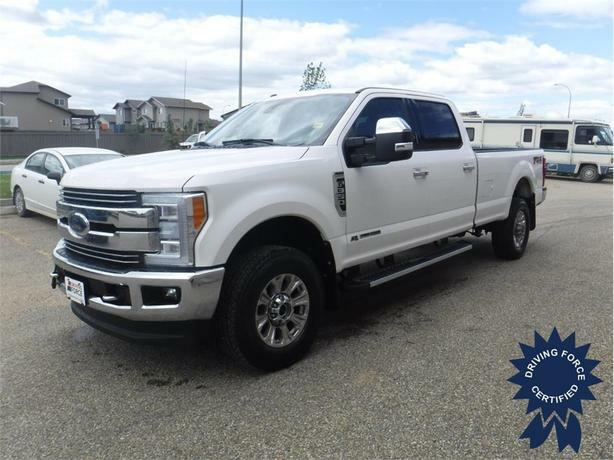 This 2017 Ford F-350 Super Duty Lariat Crew Cab 5 Passenger 4X4 comes with a 176-inch wheelbase, 8-foot long box, electronic-locking with 3.55 axle ratio, TorqShift 6-speed automatic transmission, 18-inch wheels, leather heated/cooled luxury captains chairs, FX4 4X4 Off-Road Package, transfer case and fuel skid plates, adaptive steering, twin panel moonroof, tailgate step and handle with tailgate assist, quad beam LED headlamps and LED tail lamps, navigation, remote start system, adaptive cruise control and collision warning, all-weather floor mat, six upfitter switches, Blind Spot Information System (BLIS), HD 200-amp alternator, HDD shock absorbers, front anti-roll bar, auto locking hubs, 183.6-litre fuel tank, 4240# Maximum Payload and GVWR rating of 11,500 lbs (5,216 kgs). The 6.7-litre Power Stroke V8 Turbodiesel V8 engine provides 440 horsepower at 2800 RPM and 925 lb-ft of torque at 1800 RPM. Touch base with us to obtain more information about this outstanding vehicle.